Size: 28HP. Current: +12V = 200mA, -12V = 87mA. The Z-DSP (NS) is Tiptop Audio’s 2018 update to a very successful digital Eurorack module first released back in 2009. NS stands for New Style, and whilst this new version doesn’t add any dramatic new features, it is an update to the original design and shows a solid commitment to the platform which should take the Z-DSP well into its second decade of production. The Z-DSP is a stereo effects processor which uses a cartridge system to provide a growing number of new effect algorithms. Each cartridge (priced from £49$65) contains eight new programs. If you’re so inclined, you can purchase the development kit (called NumberZ) which gives you the tools to write your own effect algorithms. Thankfully, for those of us without coding experience, a great selection of interchangeable cards is already available covering a wide variety of effect types. 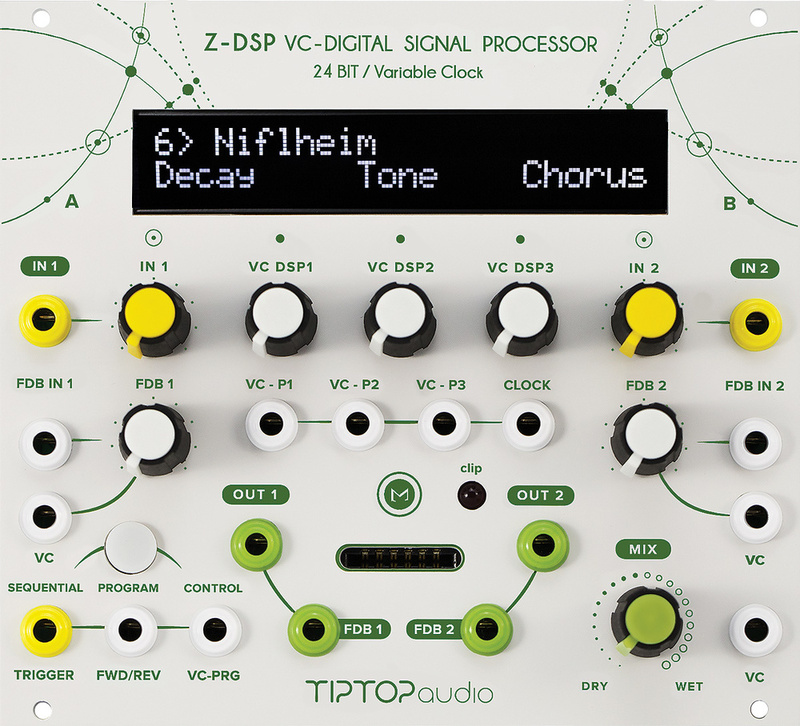 Anyone vaguely enthusiastic about Eurorack modular will likely have heard of the Z-DSP already. If you haven’t, here’s a brief summary. The Z-DSP takes a stereo or mono input, applies a chosen effect algorithm from the cartridge inserted into the front panel slot, and passes the signal to a stereo output. Every effect algorithm has three parameters to tweak either from a knob on the front panel or via CV input. An LCD display shows you what the three parameters are and will update when you select a new effect. This being modular, the Z-DSP has a few extra tricks up its sleeve. A feedback output, input and voltage-controllable attenuator are provided for each of the two channels so that you can patch other modules into the feedback path. A button and a trio of CV inputs provide various ways to change the program selection, and there’s also a clock input which controls the master clocking of the entire DSP engine. Feed it high frequency audio-rate clock (as high as 20kHz and above) for a standard hi-fi sound, but start to reduce the clock rate and the effects become gradually darker and more lo-fi. At lower clock rates, delays and reverbs turn into wonderfully grungy texture soup. The Z-DSP (NS) doesn’t add any new features to the original 2009 design, but several upgrades have been made. Most evident is the new white, green and yellow livery that is Tiptop Audio’s new standard. There’s redesigned analogue circuitry that results in better signal-to-noise ratio and better immunity to interference from other modules. The Mix control now employs equal power crossfading, resulting is smoother transition from dry to wet, and reverse polarity protection has been added, protecting you from inadvertently plugging the power cable in backwards and frying the module. The excellent Halls Of Valhalla cartridge is now included as standard along with the Dragonfly Delay MkII cartridge. These provide outstanding quality reverb and delay effects to get you started. To coincide with the New Style update, Tiptop have also released no fewer than four new cartridges: Hydra, Spirals, Mod Delay and Mariana Trench. The first three are available in a bundle called Time Domain which, as you might guess, is a collection of delay algorithms. Hydra focusses on multi-tap delays with different programs adding features to the taps like panning, filtering, pitch-shifting and diffusion. Spirals offers dual pitch-shifting delays which generate all manner of harmonising echoes and reverbs, and the final cartridge in the set is Mod Delay, which uses various modulation effects to smear, spread and generally massage the delay lines. At the same price as a single cartridge, the Time Domain bundle represents excellent value for money and really should be on any self-respecting Z-DSP owner’s shopping list. There is good news for old style Z-DSP owners too — all these new cartridges will work on the older model. I was particularly smitten with the pitch-shifting effects from Spirals. They compare most favourably against ones by bigger name manufacturers. The fourth new cartridge is Mariana Trench, a collection of programs utilising ‘Feedback Delay Networks’. These are complex delay networks which feedback on each other in various ways to create all manner of delay based effects like tuned comb filtering, resonators and unstable reverb effects which go on forever. Mariana Trench demonstrates the more experimental side of the Z-DSP and is certainly not something you’d come across on your average multi-effects unit. Great fun. Z-DSP is an ideal last stage in a modular setup. If you still work largely in mono, as modular budgets often dictate, then putting the Z-DSP at the end of your signal chain opens up the stereo field because almost every program makes use of the independent dual channels for genuine stereo effects. To (tip) top it off, the Z-DSP (NS) sounds beautiful. No matter which cartridge you load, the emerging audio is wide, spacious, rich and immersive. It is one of those rare studio items which makes almost everything you put through it sound better. In terms of pure sonic quality, it will hold its own against effects units at five times the price. Of course it doesn’t offer the same level of deep programming, but that’s fine because it’s designed to be part of bigger system. CV control and the ability to patch other modules into the feedback path open up the possibilities greatly and the result is an effects processor which can twist and morph for days. In the short time I’ve had it, the Z-DSP (NS) has become a favourite module, so much so that I am loath to send it back!